Be the first to share your favorite memory, photo or story of Roseann. This memorial page is dedicated for family, friends and future generations to celebrate the life of their loved one. 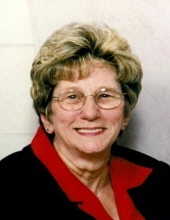 Roseann Bubanic, age 82, of Port Vue, died April 3, 2019 at home. Born April 14, 1936, in McKeesport, she was the daughter of the late Paul and Barbara (Cindrich) Martin and the wife of Bernard M. Bubanic for over 59 years. Roseann was a retired clerk from the Uni Mart in Port Vue. Prior to that, she worked at Frank's Market, Murphy's Department Store, Murphy's Warehouse and Kelsey-Hayes Co., all former McKeesport companies. She was a member of St. Mark Parish. Roseann enjoyed reading and playing solitaire on her Kindle, as of late. Her greatest joy was spending time with her family, especially her grandchildren. In addition to her husband, Roseann is survived by her children, Dr. Bernard (Jan) Bubanic of Canton, OH and Barbara (Charles) Blum of Smithton, PA; grandchildren, KaSara (Anthony) Meade of Pheonix, AZ; Troy Bubanic of Atlanta, GA, Katarina (Jon) Beatty of Canton, OH and Trent Bubanic of Canton, OH; great grandchildren, Miles and Mila Meade of Pheonix, AZ; sister, Paulette (Pat) Scatigalia of Jefferson Hills; also many nieces and nephews. Family and friends will be received at Willig Funeral Home & Crematory on April 5, 2019, from 2 to 9 p.m. Mass of Christian Burial will be celebrated on Saturday, 10 a.m., at St. Mark Parish, Port Vue Site. Fr. Gregory Medeya will be the celebrant. Burial will follow in Calvary Cemetery of Port Vue. To send flowers or a remembrance gift to the family of Roseann Bubanic, please visit our Tribute Store. "Email Address" would like to share the life celebration of Roseann Bubanic. Click on the "link" to go to share a favorite memory or leave a condolence message for the family.